There are many interesting things you can do when traveling to Chiang Mai, from visiting temples with unique architecture, joining in impressive festivals to enjoying delicious dishes with special taste … And here are 5 things you definitely should try when coming to Chiang Mai. 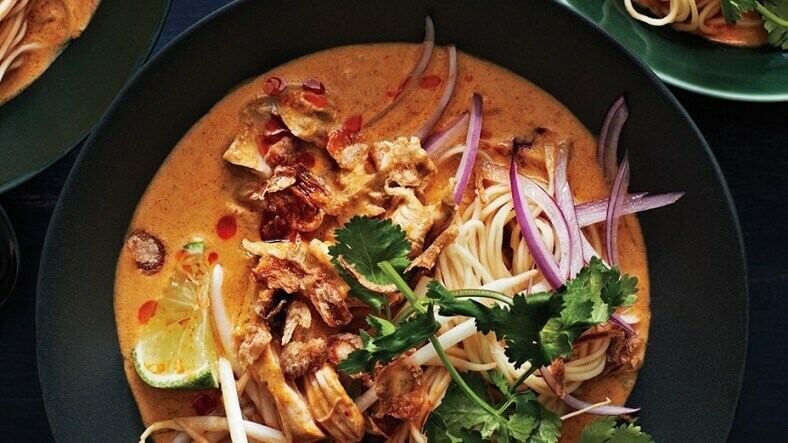 If there is a food in Chiang Mai that you must taste, it’s “Khao Soi”,a dish crispy noodles with a highlight of curry, specialty food of this place. The dish is usually served with chicken or beef, and some other spices such as: chili sauce, salted cabbage, chives and lemon. The most famous dish in the north of Thailand can be found everywhere in Chiang Mai, from the most luxurious resorts to modest food stalls on the sidewalk, it is not only delicious but also has a unique taste of Thailand. The dish is often served with a glass of bok choy (a type of veggies smoothie) to help you cool down while enjoy the spicy meal. 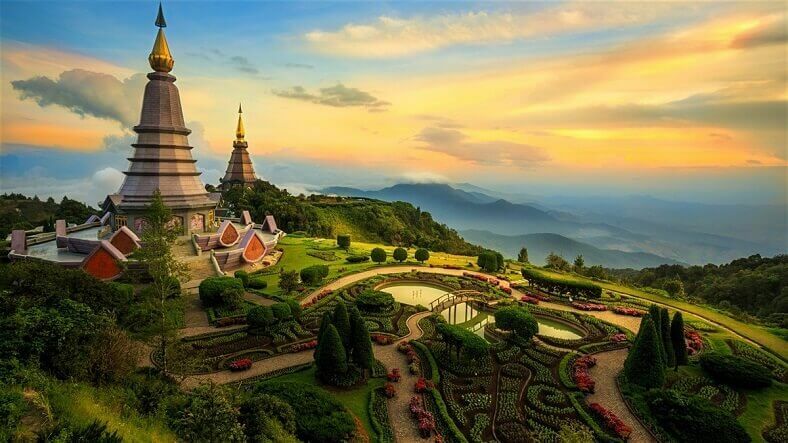 Located in the northwest of the city, Doi Suthep Mountain is the most recognizable landmark of Chiang Mai. Wat phra that doi is a beautiful temple located on the top of the mountain, the temple is often referred to as “Doi Suthep”. To reach the temple, you have to climb up about 300 steps with the statue of god snakes along the side of the mountain. When weather is good, the panoramic view of the city from top of the temple is truly spectacular. 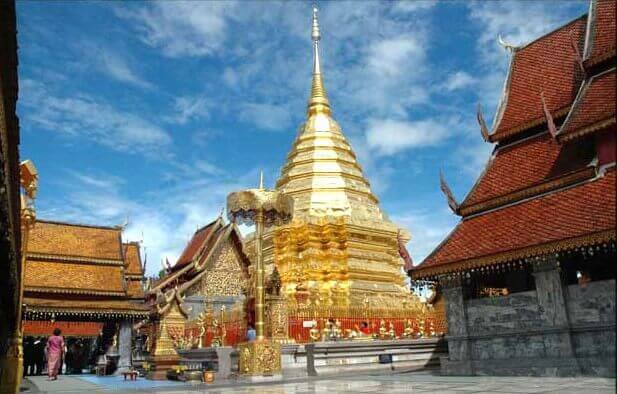 The best time for a trip to “Doi Suthep” is in the early morning, you can avoid the heat of the sun and the crowd). Both the scenery of the mountain and the beautiful road leading to the top of “Doi Suthep” are very impressive and will satisfy even the most fastidious travelers. The festivals in Chiang Mai are often held in a bustling atmosphere and adhere to the ancient traditions. One of the most impressive festivals here is the Songkran Water Festival, which celebrates the Thai New Year, takes place in three official days, but it can last up to five days in April each year (the day may change every year). On this occasion, there will be a lot of vibrant cultural events taken place around the ancient temple of Wat Phra Singh – the most popular tourist attraction in Chiang Mai. 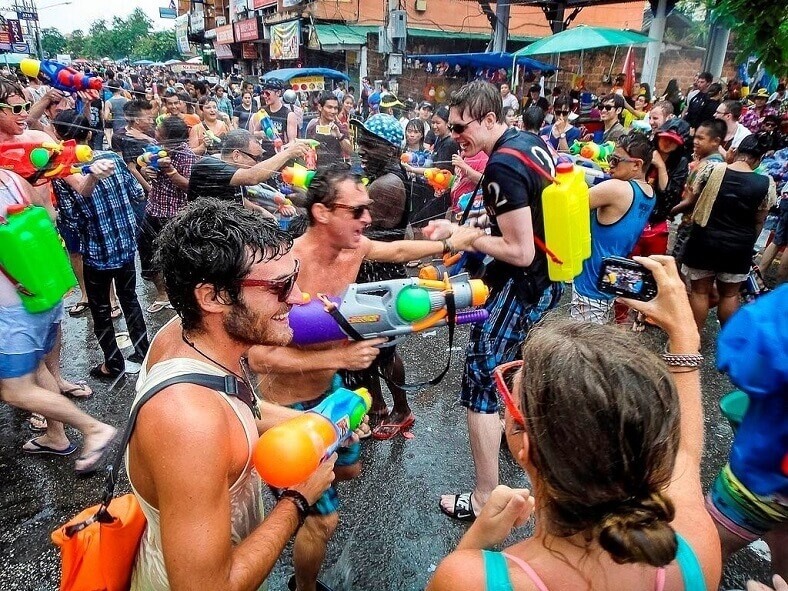 To participate in Chiang Mai’s famous “water fight”, you should prepare to get wet, because anywhere along the Ping River, or in the mall, people will have “barrels, buckets, basins, mini water hoses, water guns …” ready to splash water to the passerbies. Another impressive festival in Chiang Mai is the Yi Peng Flower Festival, which is a “local version” of Thailand’s Loy Thakrong Lantern Festival. However, instead of dropping flowers along the stream, people here choose to drop off the sky lantern. This creative option offers a unique culture and artistic identity for Chiang Mai. In recent years, despite the fact that many shopping malls have been built in the city, Chiang Mai’s lively markets still attract a large number of visitors due to their traditional traits and originality. 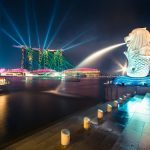 The best choices) for visitors are the night market on Chang Klan Road, the Saturday Walking Street on Wualai Road and the Sunday Walking Street on Ratchadamnoen Road. However, the Sunday Walking Street is more popular than the others, as it is home of many jewelry, fashion and handicrafts shops. If you get tired from walking around the market, you can sit on plastic chairs on the sidewalk where you can get a foot massage for about $5 an hour. 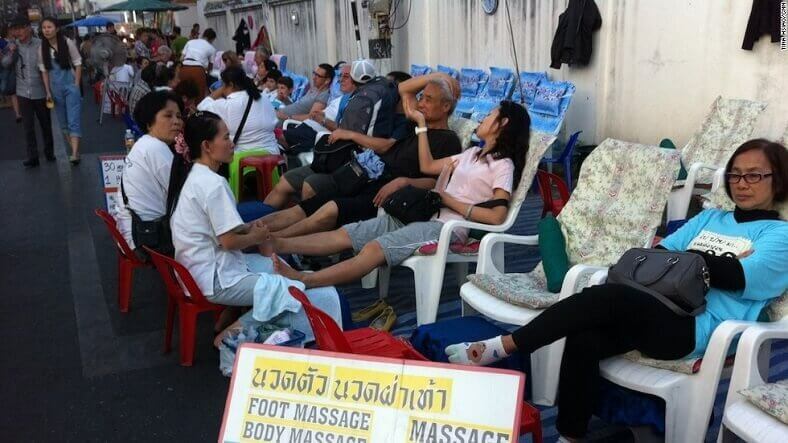 While being pampered with foot massages, you can not only sit and enjoy the glass of water, but also watch the stream of people pass by on the streets. 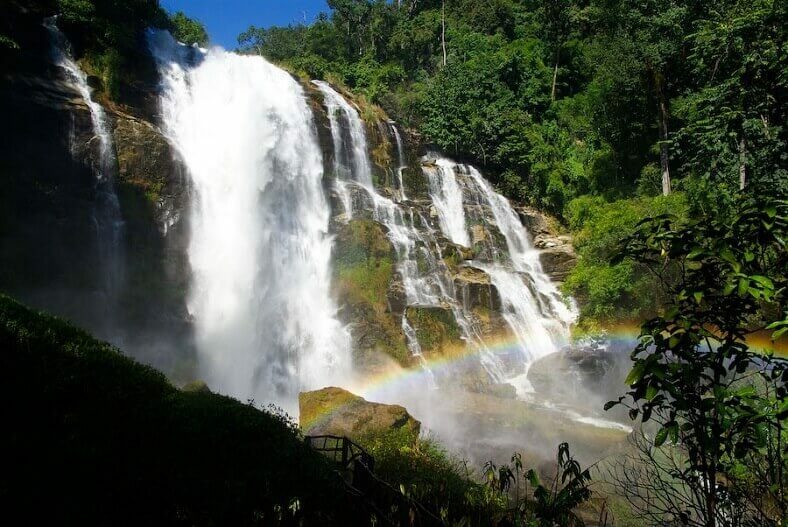 There are seven national parks located in the province to enjoy the nature without going too far from the city of Chiang Mai. You can make your own tents at the campsite or rent tents built in the parks here. Oblangan National Park and Doi Inthanon National Park are the two most famous places in Thailand with waterfalls, caves and impressive canyon. These two places only take less than 2 hours driving from the city.